This article is about the Australian territory in the Indian Ocean. For other uses, see Christmas Island (disambiguation). The Territory of Christmas Island is an Australian external territory comprising the island of the same name. Christmas Island is located in the Indian Ocean, around 350 kilometres (220 mi) south of Java and Sumatra and around 1,550 kilometres (960 mi) north-west of the closest point on the Australian mainland. It has an area of 135 square kilometres (52 sq mi). The first European to sight the island was Richard Rowe of the Thomas in 1615. The island was later named on Christmas Day (25 December) 1643 by Captain William Mynors but only settled in the late 19th century. Its geographic isolation and history of minimal human disturbance has led to a high level of endemism among its flora and fauna, which is of interest to scientists and naturalists. The majority (63 percent) of the island is included in the Christmas Island National Park, which features several areas of primary monsoonal forest. Phosphate, deposited originally as guano, has been mined on the island since 1899. The first European to sight the island was Richard Rowe of the Thomas in 1615. Captain William Mynors of the Royal Mary, an English East India Company vessel, named the island when he sailed past it on Christmas Day, in 1643. The island was included on English and Dutch navigation charts as early as the beginning of the 17th century, but it was not until 1666 that a map published by Dutch cartographer Pieter Goos included the island. Goos labelled the island "Mony" or "Moni", the meaning of which is unclear. English navigator William Dampier, aboard the English ship Cygnet, made the earliest recorded visit to the sea around the island in March 1688. He found it uninhabited. Dampier gave an account of the visit which can be found in his Voyages. Dampier was trying to reach Cocos from New Holland. His ship was blown off course in an easterly direction, arriving at Christmas Island twenty-eight days later. Dampier landed at the Dales (on the west coast). Two of his crewmen became the first Europeans to set foot on Christmas Island. During the 1872–76 Challenger expedition to Indonesia, naturalist John Murray carried out extensive surveys. In 1886, Captain John Maclear of HMS Flying Fish, having discovered an anchorage in a bay that he named "Flying Fish Cove", landed a party and made a small collection of the flora and fauna. In the next year, Pelham Aldrich, on board HMS Egeria, visited the island for ten days, accompanied by J. J. Lister, who gathered a larger biological and mineralogical collection. Among the rocks then obtained and submitted to Murray for examination were many of nearly pure phosphate of lime. This discovery led to annexation of the island by the British Crown on 6 June 1888. Soon afterwards, a small settlement was established in Flying Fish Cove by G. Clunies Ross, the owner of the Cocos (Keeling) Islands some 900 kilometres (560 mi) to the southwest, to collect timber and supplies for the growing industry on Cocos. Phosphate mining began in 1899 using indentured workers from Singapore, Malaya, and China. John Davis Murray, a mechanical engineer and recent graduate of Purdue University, was sent to supervise the operation on behalf of the Phosphate Mining and Shipping Company. Murray was known as the "King of Christmas Island" until 1910, when he married and settled in London. The island was administered jointly by the British Phosphate commissioners and district officers from the United Kingdom Colonial Office through the Straits Settlements, and later the Crown Colony of Singapore. Hunt (2011) provides a detailed history of Chinese indentured labor on the island during those years. In 1922, scientists attempted unsuccessfully to view a solar eclipse from the island to test Einstein's Theory of Relativity. From the outbreak of the South-East Asian theatre of World War II in December 1941, Christmas Island was a target for Japanese occupation because of its rich phosphate deposits. A naval gun was installed under a British officer and four NCOs and 27 Indian soldiers. The first attack was carried out on 20 January 1942, by Japanese submarine I-59, which torpedoed a Norwegian freighter, the Eidsvold. The vessel drifted and eventually sank off West White Beach. Most of the European and Asian staff and their families were evacuated to Perth. In late February and early March 1942, there were two aerial bombing raids. Shelling from a Japanese naval group on 7 March led the district officer to hoist the white flag. But after the Japanese naval group sailed away, the British officer raised the Union Flag once more. During the night of 10–11 March, a mutiny of the Indian troops, abetted by Sikh policemen, led to the killing of the five British soldiers and the imprisonment of the remaining 21 Europeans. At dawn on 31 March 1942, a dozen Japanese bombers launched the attack, destroying the radio station. The same day, a Japanese fleet of nine vessels arrived, and the island was surrendered. About 850 men of the Japanese 21st and 24th Special Base Forces and 102nd Construction Unit came ashore at Flying Fish Cove and occupied the island. They rounded up the workforce, most of whom had fled to the jungle. Sabotaged equipment was repaired and preparations were made to resume the mining and export of phosphate. Only twenty men from the 21st Special Base Force were left as a garrison. After the war, seven mutineers were traced and prosecuted by the Military Court in Singapore. In 1947, five of them were sentenced to death. However, following representations made by the newly independent government of India, their sentences were reduced to penal servitude for life. Under Commonwealth Cabinet Decision 1573 of 9 September 1958, D. E. Nickels was appointed the first official representative of the new territory. In a media statement on 5 August 1960, the minister for territories, Paul Hasluck, said, among other things, that, "His extensive knowledge of the Malay language and the customs of the Asian people... has proved invaluable in the inauguration of Australian administration... During his two years on the island he had faced unavoidable difficulties... and constantly sought to advance the island's interests." John William Stokes succeeded him and served from 1 October 1960, to 12 June 1966. On his departure, he was lauded by all sectors of the island community. In 1968, the official secretary was retitled an administrator and, since 1997, Christmas Island and the Cocos (Keeling) Islands together are called the Australian Indian Ocean Territories and share a single administrator resident on Christmas Island. Recollections of the island's history and lifestyle, and lists and timetables of the island's leaders and events since its settlement are at the World Statesmen site and in Neale (1988), Bosman (1993), Hunt (2011) and Stokes (2012). The settlement of Silver City was built in the 1970s, with aluminium-clad houses that were supposed to be cyclone-proof. The 2004 Indian Ocean earthquake and tsunami centred off the western shore of Sumatra in Indonesia, resulted in no reported casualties, but some swimmers were swept some 150 metres (490 ft) out to sea for a time before being swept back in. From the late 1980s and early 1990s, boats carrying asylum seekers, mainly departing from Indonesia, began landing on the island. In 2001, Christmas Island was the site of the Tampa controversy, in which the Australian government stopped a Norwegian ship, MV Tampa, from disembarking 438 rescued asylum-seekers. The ensuing standoff and the associated political reactions in Australia were a major issue in the 2001 Australian federal election. The Howard government operated the "Pacific Solution" from 2001 to 2007, excising Christmas Island from Australia's migration zone so that asylum seekers on the island could not apply for refugee status. Asylum seekers were relocated from Christmas Island to Manus Island and Nauru. In 2006, an immigration detention centre, containing approximately 800 beds, was constructed on the island for the Department of Immigration and Multicultural Affairs. Originally estimated to cost A$276 million, the final cost was over $400 million. In 2007, the Rudd government decommissioned Manus Regional Processing Centre and Nauru detention centre; processing would then occur on Christmas Island itself. In December 2010, 48 asylum-seekers died just off the coast of the island in what became known as the Christmas Island boat disaster when the boat they were on, hit rocks off Flying Fish Cove, and then smashed against nearby cliffs. In the case Plaintiff M61/2010E v Commonwealth of Australia, the High Court of Australia ruled, in a 7–0 joint judgment, that asylum seekers detained on Christmas Island were entitled to the protections of the Migration Act. Accordingly, the Commonwealth was obliged to afford asylum seekers a minimum of procedural fairness when assessing their claims. The mountain was originally a volcano, and some basalt is exposed in places such as The Dales and Dolly Beach, but most of the surface rock is limestone accumulated from coral growth. The karst terrain supports numerous anchialine caves. The summit of this mountain peak is formed by a succession of Tertiary limestones ranging in age from the Eocene or Oligocene up to recent reef deposits, with intercalations of volcanic rock in the older beds. Steep cliffs along much of the coast rise abruptly to a central plateau. Elevation ranges from sea level to 361 m (1,184 ft) at Murray Hill. The island is mainly tropical rainforest, 63% of which is national parkland. The narrow fringing reef surrounding the island poses a maritime hazard. Christmas Island lies 2,600 kilometres (1,600 mi) northwest of Perth, Western Australia, 350 km (220 mi) south of Indonesia, 975 km (606 mi) ENE of the Cocos (Keeling) Islands, and 2,748 km (1,708 mi) west of Darwin, Northern Territory. Its closest point to the Australian mainland is 1,560 km (970 mi) from the town of Exmouth, Western Australia. Christmas Island is located towards the southern edge of the equatorial region. Climate is tropical and temperatures vary little throughout the year. The highest temperature is usually around 29 °C (84 °F) in March and April, while the lowest temperature is 23 °C (73 °F) and occurs in August. There is a dry season from July to October with only occasional showers. The wet season is between November and June, and includes monsoons, with downpours of rain at random times of the day. Tropical cyclones also occur in the wet season, bringing very strong winds, rain and enormous seas. As of the 2016 Australian census, the population of Christmas Island is 1,843. 21.2% of the population had Chinese ancestry (up from 18.3% in 2001), 12.7% had generic Australian ancestry (11.7% in 2001), 12% had Malay ancestry (9.3% in 2001), 10% had English ancestry (8.9% in 2001), and 2.3% of the population was of Irish origin (the same share as in 2001). 48.1% of the population has undetermined ancestry as of 2016[update], most of them are people born in Christmas Island and many are of Chinese and Malay origin. 38.5% of people were born in Australia. The next most common country of birth was Malaysia at 20.1%. 27.8% of the population spoke English as their family language, while 17.2% spoke Mandarin Chinese, 17.2% spoke Malay, 3.7% Cantonese, 1.5% Southern Min, and 1% Tagalog. Additionally, there are small local populations of Malaysian Indians and Eurasians. In early 1986, the Christmas Island Assembly held a design competition for an island flag; the winning design was adopted as the informal flag of the territory for over a decade, and in 2002 it was made the official flag of Christmas Island. Phosphate mining had been the only significant economic activity, but in December 1987 the Australian government closed the mine. In 1991, the mine was reopened by a consortium which included many of the former mine workers as shareholders. With the support of the government, the $34 million Christmas Island Casino and Resort opened in 1993 but was closed in 1998. As of 2011[update], the resort has re-opened without the casino. The Australian government in 2001 agreed to support the creation of a commercial spaceport on the island, however, this has not yet been constructed and appears that it will not proceed. The Howard government built a temporary immigration detention center on the island in 2001 and planned to replace it with a larger, modern facility at North West Point until Howard's defeat in the 2007 elections. Religious beliefs are diverse, but people are very tolerant of each other's religions. The religions practised include Buddhism, Taoism, Confucianism, Islam, and Christianity. There is a Mosque in Flying Fish Cove. With all of these religions, there are many religious festivals, such as Spring Festival, Hari Raya, Christmas and Easter. Additionally, there is a Bahá'í centre on the island. The Dales is a rainforest in the western part of the island and consists of seven deep valleys, all of which were formed by spring streams. Hugh's Dale waterfall is part of this area and is a popular attraction. The annual breeding migration of the Christmas Island red crabs is a popular event. Fishing is another common activity. There are many distinct species of fish in the oceans surrounding Christmas Island. Snorkeling and swimming in the ocean are two other activities that are extremely popular. Walking trails are also very popular, for there are many beautiful trails surrounded by extravagant flora and fauna. 63% of the island is national park making it one of the main attractions to experience when visiting. Christmas Island was uninhabited until the late 19th century, allowing many species to evolve without human interference. Two-thirds of the island has been declared a National Park, which is managed by the Australian Department of Environment and Heritage through Parks Australia. Christmas Island contains unique species, both of flora and fauna, some of which are threatened with, or have become, extinct. The dense rainforest has grown in the deep soils of the plateau and on the terraces. The forests are dominated by 25 tree species. Ferns, orchids and vines grow on the branches in the humid atmosphere beneath the canopy. The 135 plant species include at least 18 that are found nowhere else. The rainforest is in great condition despite the mining activities over the last 100 years. Areas that have been damaged by mining are now a part of an ongoing rehabilitation project. The island is small and covers 135 square kilometres of land which 63% of that land has been declared National park. Christmas Island's endemic plants include the trees Arenga listeri, Pandanus elatus and Dendrocnide peltata var. murrayana; the shrubs Abutilon listeri, Colubrina pedunculata, Grewia insularis and Pandanus christmatensis; the vines Hoya aldrichii and Zehneria alba; the herbs Asystasia alba, Dicliptera maclearii and Peperomia rossii; the grass Ischaemum nativitatis; the fern Asplenium listeri; and the orchids Brachypeza archytas, Flickingeria nativitatis, Phreatia listeri and Zeuxine exilis. Two species of native rats, the Maclear's and bulldog rats, have become extinct since the island was settled, while the Javan rusa has been introduced. The endemic Christmas Island shrew has not been seen since the mid-1980s and may be already extinct, while the Christmas Island pipistrelle (a small bat) is presumed to be extinct. The fruit bat (flying fox) species Pteropus natalis is only found on Christmas Island, its epithet natalis is a reference to that name. The species is probably the last native mammal, and an important pollinator and rainforest seed-disperser; the population is also in decline and under increasing pressure from land clearing and introduced pest species. The flying fox's low rate of reproduction (one pup each year) and high infant mortality rate makes it especially vulnerable and the conservation status is as critically endangered. Flying foxes are an 'umbrella' species helping forests regenerate and other species survive in stressed environments. The land crabs and seabirds are the most noticeable fauna on the island. Christmas Island has been identified by BirdLife International as both an Endemic Bird Area and an Important Bird Area because it supports five endemic species and five subspecies as well as over one percent of the world populations of five other seabirds. Twenty terrestrial and intertidal species of crab have been described here, of which thirteen are regarded as true land crabs, being dependent on the ocean only for larval development. Robber crabs, known elsewhere as coconut crabs, also exist in large numbers on the island. The annual red crab mass migration (around 100 million animals) to the sea to spawn has been called one of the wonders of the natural world. This takes place each year around November – after the start of the wet season and in synchronisation with the cycle of the moon. Once at the ocean, the mothers release the embryos where they can survive and grow until they are able to live on land. The island is a focal point for seabirds of various species. Eight species or subspecies of seabirds nest on it. The most numerous is the red-footed booby, which nests in colonies, using trees on many parts of the shore terrace. The widespread brown booby nests on the ground near the edge of the seacliff and inland cliffs. Abbott's booby (listed as endangered) nests on tall emergent trees of the western, northern and southern plateau rainforest, the only remaining nesting habitat for this bird in the world. Another endangered and endemic bird, the Christmas frigatebird, has nesting areas on the northeastern shore terraces. The more widespread great frigatebirds nest in semi-deciduous trees on the shore terrace, with the greatest concentrations being in the North West and South Point areas. The common noddy and two species of bosun or tropicbirds, with their brilliant gold or silver plumage and distinctive streamer tail feathers, also nest on the island. Of the ten native land birds and shorebirds, seven are endemic species or subspecies. This includes the Christmas thrush and the Christmas imperial pigeon. Some 86 migrant bird species have been recorded as visitors to the island. Six species of butterfly are known to occur on Christmas Island. These are the Christmas swallowtail (Papilio memnon), striped albatross (Appias olferna), Christmas emperor (Polyura andrewsi), king cerulean (Jamides bochus), lesser grass-blue (Zizina otis), and Papuan grass-yellow (Eurema blanda). Insect species include the yellow crazy ant (Anoplolepis gracilipes), introduced to the island and since subjected to attempts to destroy the supercolonies that emerged with aerial spraying of the insecticide Fipronil. Radio broadcasts from Australia include ABC Radio National, ABC Kimberley, Triple J and Red FM. All services are provided by satellite links from the mainland. Broadband internet became available to subscribers in urban areas in mid-2005 through the local internet service provider, CIIA (formerly dotCX). A postal agency was opened on the island in 1901 and sold stamps of the Strait Settlements. After the Japanese occupation (1942–45), postage stamps of the British Military Administration in Malaya were in use, then stamps of Singapore. In 1958, the island received its own postage stamps after being put under Australian custody. It had a large philatelic and postal independence, managed first by the Phosphate Commission (1958–1969) and then by the island's administration (1969–93). 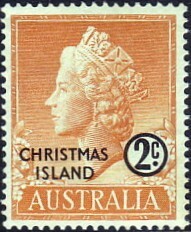 This ended on 2 March 1993 when Australia Post became the island's postal operator; Christmas Island stamps may be used in Australia and Australian stamps may be used on the island. The standard gauge 18 km (11 mi) Christmas Island Phosphate Co.'s Railway from Flying Fish Cove to the phosphate mine was constructed in 1914. It was closed in December 1987, when the Australian government closed the mine, and since has been recovered as scrap, leaving only earthworks in places. Virgin Australia Regional Airlines provides two weekly flights to Christmas Island Airport from Perth, Western Australia, Garuda Indonesia conduct weekly open-charter flights from/to Jakarta with bookings done through Christmas Island Travel Exchange and Malindo Air operate fortnightly open-charter flights from/to Kuala Lumpur with bookings done through Evercrown Air Services. The island-operated crèche is in the Recreation Centre. Christmas Island District High School, catering to students in grades P-12, is run by the Western Australian Education Department. There are no universities on Christmas Island. Rugby league is growing in the island: the first game was played in 2016, and a local committee, with the support of NRL Western Australia, is willing to organize matches with nearby Cocos Islands and to create a Rugby League Competition in the Indian Ocean area. ^ English does not have de jure status in Christmas Island and in Australia, but it is the de facto language of communication in government. ^ a b c d e f g Australian Government – Department of Infrastructure and Regional Development. "2016 Census: Christmas Island" (PDF). Retrieved 10 January 2018. ^ Luscombe, Stephen (2019). "Christmas Island". The British Empire. Retrieved 16 March 2019. ^ "Save Christmas Island – Introduction". The Wilderness Society. 19 September 2002. Archived from the original on 9 June 2007. Retrieved 14 April 2007. ^ James, David J.; Mcallan, Ian A.W. (August 2014). "The birds of Christmas Island, Indian Ocean: A review". ResearchGate. Australian Field Ornithology. Retrieved 20 January 2017. ^ "Department of the Environment, Water, Heritage and the Arts – Christmas Island History". Australian Government. 8 July 2008. Archived from the original on 4 March 2012. Retrieved 26 April 2009. ^ a b c d e Chisholm, Hugh, ed. (1911). "Christmas Island" . Encyclopædia Britannica. 6 (11th ed.). Cambridge University Press. pp. 294–295. ^ "Digital Collections – Maps – Goos, Pieter, ca. 1616–1675. Paskaerte Zynde t'Oosterdeel Van Oost Indien (cartographic material) : met alle de Eylanden deer ontrendt geleegen van C. Comorin tot aen Iapan". National Library of Australia. Retrieved 26 April 2009. ^ Carney, Gerard (2006). The constitutional systems of the Australian states and territories. Cambridge University Press. p. 477. ISBN 0-521-86305-8. The uninhabited island was named on Christmas Day, 1643, by Captain William Mynors as he sailed past, leaving to William Dampier the honour of first landing ashore in 1688. ^ Dampier, Captain William (1703). A New Voyage Round The World. The Crown in St Paul's Church-yard, London, England: James Knapton. pp. Contemporary full panelled calf with raised bands to spine and crimson morocco title labels, crimson sprinkled edges, 8vo. ^ "Where is Christmas Island?". Hamilton Stamp Club. Retrieved 18 September 2016. ^ a b "History". Christmas Island Tourism Association. Archived from the original on 8 December 2014. Retrieved 18 September 2016. ^ Jupp, James (2001). "Christmas Islanders". The Australian People: An Encyclopedia of the Nation, Its People and Their Origins. Cambridge, UK: Cambridge University Press. p. 225. ISBN 9780521807890. Retrieved 2 January 2017. ^ John Hunt. Eclipse on Christmas Island. newspaper article in 'The Canberra Times', 5 September 2012. ^ a b c d e f g h L, Klemen (1999–2000). "The Mystery of Christmas Island, March 1942". Forgotten Campaign: The Dutch East Indies Campaign 1941–1942. ^ L, Klemen (1999–2000). "Allied Merchant Ship Losses in the Pacific and Southeast Asia". Forgotten Campaign: The Dutch East Indies Campaign 1941–1942. ^ Cressman, Robert J. "The Official Chronology of the U.S. Navy in World War II Chapter IV: 1942". Hyperwar/. ^ "All set for transfer. (1958, May 16)". The Straits Times, p. 2. ^ "Kerr, A. (2009). A federation in these seas: An account of the acquisition by Australia of its external territories, with selected documents". Barton, A.C.T. : Attorney General's Dept, p. 329. (Call no. : R 325.394 KER). ^ "Mr D. E. Nickels and Mrs Nickels interviewed by Jan Adams in the Christmas Island life story oral history project". National Library of Australia. ^ "Christmas Island". World Statesmen. ^ "Island Life – Christmas Island – About". Archived from the original on 8 February 2002. Retrieved 26 June 2013. ^ Fowler, Connie (2003). "Karsten Klepsuik, John Howard and the Tampa Crisis: Good Luck or Good Management?". Nordic Notes. Celsius Centre for Scandinavian Studies (Flinders University). ISSN 1442-5165. Archived from the original on 25 April 2012. Retrieved 19 July 2013. ^ "Detention on Christmas Island". Amnesty International. 10 March 2009. Archived from the original on 17 August 2010. Retrieved 26 April 2009. ^ "Savings for Labor's Better Priorities: Close Nauru and Manus Island detention centres". Public release of costing. electioncostings.gov.au. 15 November 2007. Archived from the original (RTF download) on 12 May 2013. Retrieved 19 July 2013. ^ Needham, Kirsty; Stevenson, Andrew; Allard, Tom (16 December 2010). "Doomed asylum seekers' boat not being tracked by Customs: minister". The Sydney Morning Herald. Retrieved 16 December 2010. ^ "Leaders pay tribute to asylum shipwreck victims". ABC. ABC/AAP. 9 February 2011. ^ Hume, David (25 November 2010). "Offshore processing: has the bar been lifted?". Archived from the original on 1 July 2016. Retrieved 17 August 2016. ^ Rintoul, Stuart (19 July 2013). "Pre-election surge pushes island centres far beyond capacity". The Australian. Retrieved 20 June 2013. ^ "After 10 years, the notorious Christmas Island detention centre has quietly closed". The Sydney Morning Herald. 4 October 2018. ^ "Christmas Island: Australia to reopen controversial migrant detention camp". The Independent. Retrieved 13 February 2019. ^ "Submission on Development Potential No. 37" (PDF). Northern Australia Land and Water Taskforce. 16 August 2007. Archived from the original (PDF) on 20 May 2009. Retrieved 26 April 2009. ^ "Christmas island". World Factbook. CIA. 23 April 2009. Retrieved 26 April 2009. ^ Iliffe T, Humphreys W (2016). "Christmas Islands Hidden Secret". Advanced Diver Magazine. Retrieved 2 January 2016. ^ Geoscience Australia. "Remote Offshore Territories". Retrieved 20 January 2018. ^ "Christmas Island Beaches". Christmas Island – A Natural Wonder. Christmas Island Tourism Association. Archived from the original on 13 January 2017. Retrieved 2 January 2017. ^ "Climate statistics for Christmas Island". Bureau of Meteorology. Retrieved 21 September 2011. ^ Dennis, Simone (2008). Christmas Island: An Anthropological Study. Cambria Press. pp. 91–. ISBN 9781604975109. ^ First Assistant Secretary, Territories Division (30 January 2008). "Territories of Australia". Attorney-General's Department. Archived from the original on 31 January 2009. Retrieved 7 February 2008. The Federal Government, through the Attorney-General's Department administers Ashmore and Cartier Islands, Christmas Island, the Cocos (Keeling) Islands, the Coral Sea Islands, Jervis Bay, and Norfolk Island as Territories. ^ First Assistant Secretary, Access to Justice Division (2 February 2011). "Territories of Australia". Attorney-General's Department. Archived from the original on 14 August 2011. Retrieved 28 August 2011. Under the Administrative Arrangements Order made on 14 September 2010, responsibility for services to Territories was transferred to the Department of Regional Australia, Regional Development and Local Government. ^ "Profile of the electoral division of Lingiari (NT)". Australian Electoral Commission. Retrieved 2 May 2016. ^ Joyner, Tom (7 March 2019). "Apathy and disillusionment on Christmas Island as residents prepare for federal election". Australian Broadcasting Corporation. Retrieved 7 March 2019. ^ Neville-Hadley, Peter (14 December 2017). "Christmas Island – the next big thing in travel? Home to Chinese, Indians and Malays, it's a fascinating mix of cultures". www.scmp.com. South China Morning Post. Retrieved 17 January 2017. ^ Christmas Island Tourism – Culture Archived 24 January 2014 at the Wayback Machine. Christmas.net.au. Retrieved on 2014-05-25. ^ Meek, Paul D. "The History of Christmas Island and the Management of its Karst Features" (PDF). Helictite. 37 (2): 31–36. Retrieved 17 January 2018. ^ "Pteropus natalis – Christmas Island Flying-fox, Christmas Island Fruit-bat". Species Profile and Threats Database. Retrieved 24 December 2018. ^ BirdLife International. (2011). Important Bird Areas factsheet: Christmas Island. Downloaded from "Archived copy". Archived from the original on 10 July 2007. Retrieved 2013-05-07. CS1 maint: Archived copy as title (link) on 23 December 2011. ^ "Geoscience Australia on Christmas Island". Archived from the original on 5 February 2007. ^ Braby, Michael F. (2008). The Complete Field Guide to Butterflies of Australia. CSIRO Publishing. ISBN 0 643 09027 4. ^ Beeton, Prof. Bob; Burbidge, Dr. Andrew. "Final report : Christmas Island Expert Working Group". National Parks. Department of the Environment and Energy. Retrieved 24 December 2018. ^ "List of licensed broadcasting transmitters". ACMA. Retrieved 28 December 2013. ^ "Christmas Island traveller information". Infrastructure and Regional Development. ^ "Recreation Centre". Archived from the original on 15 September 2009. ^ "Public library". Archived from the original on 15 September 2009. "Flora: Endemic plants". Parks and Reserves: Christmas Island National Park. Australia Government – Dept of Sustainability, Environment, Water, Population and Communities. 21 November 2012. Retrieved 25 December 2012. L, Klemen (1999–2000). "Forgotten Campaign: The Dutch East Indies Campaign 1941–1942". Archived from the original on 26 July 2011. Wikimedia Commons has media related to Christmas Island. Wikivoyage has a travel guide for Christmas Island. "Christmas Island". The World Factbook. Central Intelligence Agency.